Rhode Island is a small state with a large amount of water in it. Known as the Ocean State, the dominant geographic features include Narragansett Bay, Block Island Sound, Rhode Island Sound, and the Atlantic Ocean. The state has over 400 miles of coastline including the bay, its islands, and the southern shore. About 32% of the state (500 square miles) is covered by water. What is Rhode Island’s maritime history? Rhode Island has always had an association with the sea. Archeological sites along the coastline indicate the area was used by native groups for over 5,000 years. The bay was first visited by European navigators in 1524 and, about a hundred years later, British settlers arrived and purchased Aquidneck Island from the Narragansett Indians. The town of Newport was the fifth most prosperous commercial center of the original 13 British colonies. In 1775, the colony of Rhode Island established the first Navy in the Western Hemisphere. More than 200 years later, Newport continues to have a Navy presence, and Narragansett Bay is considered by many to be the Cradle of the American Navy. With more than 2,000 shipwrecks in its waters, Rhode Island claims more shipwrecks per square mile than any other state. The state’s underwater sites include colonial trading ships, ships of war from the American Revolutionary War to World War II, and a myriad of other types of vessels from the 19th and 20th centuries. Some of the state’s most historically significant shipwrecks date to the American Revolutionary War when many American and British vessels were lost in the battle for Rhode Island. After taking Newport in 1776, the British destroyed more than 150 American ships in the harbors of Bristol and Warren, in Narragansett Bay, and in the Kickemuit and Sakonnet Rivers. 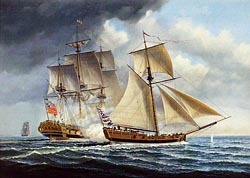 During the Siege of Newport in 1778, when the French fleet arrived to assist the American army in its assault on the British, the Royal Navy destroyed many of its own ships to avoid capture and to act as a blockade. This included scuttling three ships in the Sakonnet River, destroying four frigates on the west coast of Aquidneck Island, and sinking 45 ships in Newport Harbor. 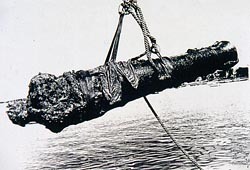 A few shipwrecks from the Revolutionary War have been located and recovered, some are likely destroyed by modern dredging, and others remain to be found. The shipwrecks HMS Cerberus and HMS Lark were found in the 1970s and listed in the National Register of Historic Places. Recent archeological surveys of the harbor have identified at least six shipwrecks that appear to be from the 18th century and part of the British transport fleet that was scuttled as a blockade. Who takes care of Rhode Island's underwater archeological sites? The Rhode Island Historical Preservation and Heritage Commission coordinates and undertakes research and survey to locate, identify, evaluate, and preserve the state’s archeological sites including sites underwater. The Commission maintains files on recorded sites, issues permits for investigations undertaken by others, and takes care of artifacts recovered from sites. To accomplish work at underwater sites, the Commission works closely with the Rhode Island Marine Archaeology Project and uses volunteer sport divers who have received instruction in the basics of underwater archeology. You need a permit from the Historical Preservation and Heritage Commission to conduct archeological investigations at sites on land owned or controlled by the state, including submerged land, and at sites that are state landmarks. Permits also are issued for investigations associated with undertakings of government agencies. Permits are issued to persons, organizations, institutions or agencies that are: qualified by experience and training, financially able, and adequately equipped to carry out the proposed field investigations. Permitted work is monitored by the Commission and must be carried out according to the Commission's Standards for Archaeological Survey. All specimens collected from state-owned lands or submerged bottoms under jurisdiction of the state remain the property of the state and under the custody of the Commission. What laws concern underwater archeology in Rhode Island? Rhode Island considers its archeological resources on land and underwater to be significant assets of the state that should be identified, interpreted, preserved, and protected for the general welfare of the public. The state’s laws governing the Historical Preservation and Heritage Commission are found in Chapter 42-45 et seq., of Title 42 (State Affairs and Government) of the General Laws of Rhode Island. The Antiquities Act of Rhode Island is in Chapter 42-45.1 et seq., of Title 42.